Make up to $3,000 per month. Work from anywhere. No more marketing. We bring clients to you. Counseling on rTribe is easy, effective, secure, and ethical. If you’re looking to stop doing marketing, find a new revenue stream, or improve your flexibility in how and where you work, you can reach new clients that you couldn’t previously access. rTribe is the only online counseling and coaching platform that has an integrated social recovery community. Your clients will have additional tools and a committed community to provide daily support. Unlike typical counseling and coaching, you won’t be alone in your work. Licensed counselors and certified coaches are carefully screened and validated. We have advanced cybersecurity tools to keep data secure and to protect against data leaks and hackers. 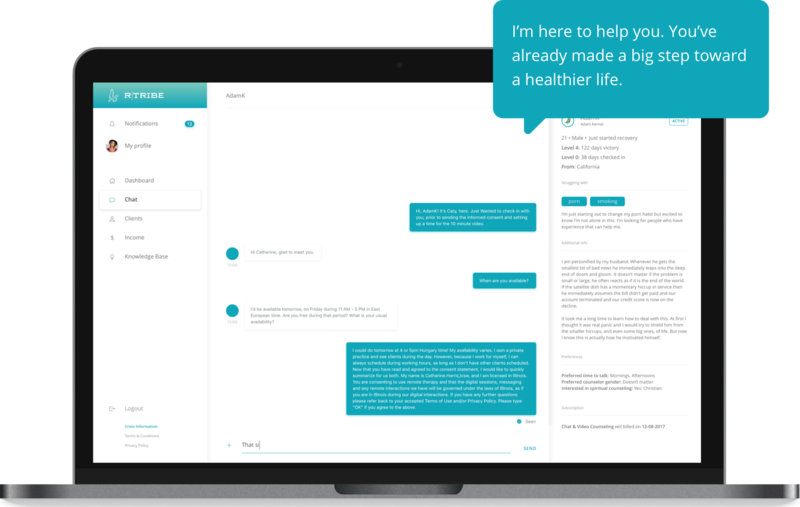 More than 3000,000 people have tried rTribe as a tool for healing. Now you will have access to this community, for those who are interested in counseling. You will not only provide professional support, but the rTribe platform helps connect your clients to a community of people seeking healing. They can stay connected to the tools rTribe provides to improve their transformation. rTribe empowers you to have helpful data on the healing progress of your clients by daily tracking your client’s mood, healthy behaviors, sobriety, and acting out patterns. rTribe is Easy to use! Work from anywhere, anytime, as long as you have a computer or mobile device and can connect to the internet. Benefit from the rTribe community of licensed counselors and professional coaches. Say goodbye to being an isolated provider. Provide excellent care for your clients through our new cutting edge platform. You don’t have to worry about marketing. We bring clients to you. Is the data kept secure? Safety, and keeping private health information (PHI) secure are our top priorities. We are HIPAA compliant, use bank-grade encryption, and take precautions to protect the data on technical, administrative, and physical levels. How do I get clients on rTribe? That’s where we come in. Simply join rTribe and we will use TribeMatching technology to connect you to clients who are looking for support, and match your clinical areas of focus. We take into consideration your experience, specialties, location, preferred time to work, and carefully support the specific needs of the client. What kind of client load and time commitment should I expect? Counselors and coaches are independent providers and each manages her or his own practice. So it’s really up to you. We recommend you have a minimum caseload and that you communicate with your clients Monday through Friday, but the amount can and does vary from provider to provider. You can make rTribe fit your needs and that can change as your life does. No! There is no cost to join. You will earn approximately $75-$135 an hour. You will begin making income from your first client. There is a 7 day consultation period for new clients so you can set up a consultation with them to assess their fit, commitment, and which pricing package and level of support that you recommend and that they want. I’m a licensed therapist, can I work with clients outside my State? You can provide counseling and coaching through rTribe. For counseling you will need to follow your board policies. Providing services as a coach you can work with clients outside the State(s) and country you are licensed in. This greatly increases the number of clients you can work with. What about the money? How much can I earn? You can earn $8,000 a month. In other words, make approximately $75-$135 an hour. We think that’s pretty awesome given that you’ll have no overhead for rent, and no time or money spent marketing or handling billing. You’ll get paid the 1st of the month after completing the month of services for each client. Since clients pay monthly subscriptions, we make it easier to forecast your monthly income. Clients initially choose which subscription they want and get matched with a Counselor/Coach who fits what they are looking for. The Counselor can help them assess, over the course of treatment, if another subscription level is more appropriate. The Counselor/Coach can set up their own schedule and arrangement that works for both. •These one-off live bundles will allow for great flexibility in session formats, such as a quick check-in session, or enable a counselor to extend their 30 minute session to 45 or 60 minutes and get paid for the longer sessions. •Bundles can only be purchased after a client signs up for a subscription. •We hope to release this shortly after the beta launch of the pilot, before the public launch in October. You can always reach us at feedback@rtribe.org if you have any questions. We’d love to hear from you. What are the requirements to be a counselor or coach on rTribe? If you are a counselor, you can also work as a coach on rTribe. 1. To apply as a licensed provider you need to be licensed by a state board to provide counseling (e.g., LCSW, LMFT, LPC, PsyD or similar credentials). To apply as a Professional Coach you need to show your training, certification(s), and experience. If you are a licensed provider you do not need a separate coaching certificate. 2. You need malpractice insurance if you are a licensed clinician and it is highly recommend you use personal liability insurance if you are a coach. 3. You need a reliable connection to the internet. But you probably wouldn’t be reading this if you didn’t. If that’s you, we’d love to hear from you. Please fill out the application and we will get back to you soon. Can I join rTribe if I’m not licensed? Yes! You need to be a Certified Coach, or have the experience or training to prove you have the skills for the services you provide. Then you simply apply as a Professional Coach. If you are accepted you can work with clients both nationally and internationally. If you are an intern or if you require supervision to provide counseling services, you cannot be a provider at rTribe as a licensed counselor. But if you are a certified coach then you can provide services on rTribe. In other words, if you are a recovery coach, business coach, substance abuse counselor, pastoral counselor, or nurse and you do not have a current license to practice mental health counseling, please apply as a professional coach. Are counselors and coaches employees of rTribe? Counselors and coaches are independent providers, not employees of rTribe. By joining us, we think of you as part of the rTribe family, so we deeply care that you thrive in your practice. We want to learn from and with you, support you, and encourage you. Your work is too important to not be given every chance to succeed. For those who sign up to add coaching or therapy, who’s clients are these? rTribe’s or the therapists? Counselors/Coaches are independent providers not employees of rTribe. These are your clients. We think of rTribe as the ‘digital space’ for the change process. The rTribe platform provides the infrastructure, like renting a room to do in person therapy, but the counselors/coaches manage their own clients, and their own legal and ethical standards according to their Board, license, certification, etc. rTribe stores the client data and keeps it secure, and notes can be accessed and downloaded if a counselor leaves the rTribe platform. How does scheduling or availability work? Can the coach block off time for vacations etc. The Counselor/Coach sets their own schedule and availability with the client including, of course, vacations or days/times when the provider isn’t working. Session time preference is one of the matching criteria. The provider sets their case load and can change this at any time, according to their needs. How are matches to clients made? Is it like a pool of coaches available, or assigned 1:1? 3. Clients get TribeMatched to their individual Counselor/Coach based on the preferences, specialty, and availability of the provider. 4. The Provider gets a notice that they have a new client, and can accept or decline the new match. 5. Once the Provider accepts the new client, the client has a 7 day period to schedule an initial consultation and can cancel within that time without getting charged. 6. Clients can change subscription levels throughout the course of treatment, which needs to be confirmed by their Counselor/Coach, and of course this will ideally be based on the recommendation of their Counselor/Coach.